The Canadian Mountain Running Championships came to Golden armed with their fair share of human power! The field included some of the best half and full marathon runners in Canada and many past and present Canadian national team mountain runners. When Golden held the CMRC's back in 2015, the course was primarily on a service road. While definitely uphill, the route was not very technical. This year the course was quite different, mixing service road with technical single track and steep climbs on the lower section of Kicking Horse mountain. On the upper mountain, the last 2 km of the course was confined to the service road due to snow - in true Canadian fashion! 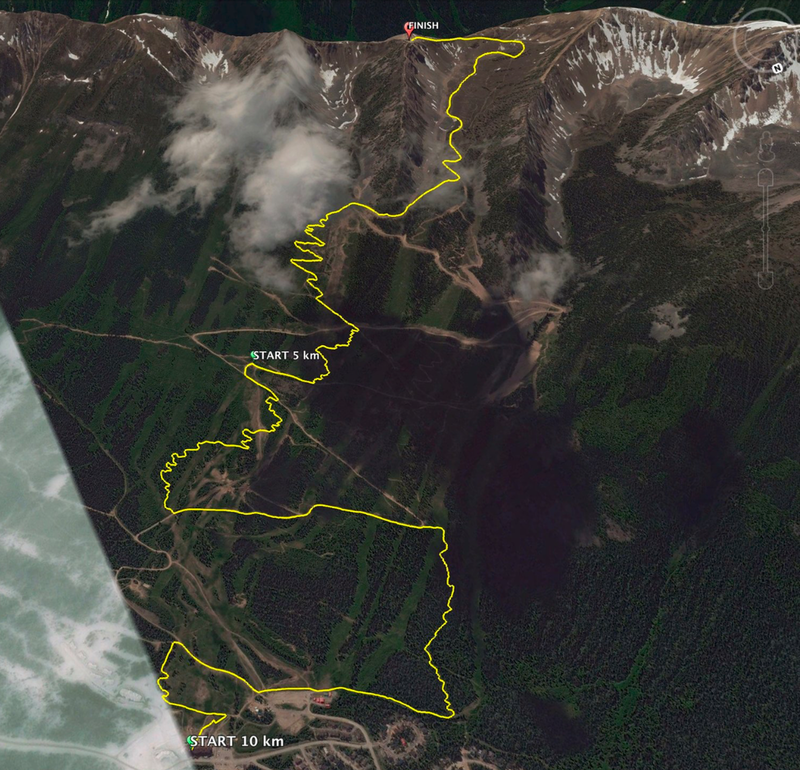 "This year, the Canadian Mountain Running Championships were on an "up-only" course meaning that we started at the base of Kicking Horse ski hill and ran to the Eagle's Eye restaurant at the top of the hill. The restaurant is at an elevation of 2,350m (7,700 feet). The distance was 10 to 11 km with 1,205m of ascent and 135m of descent. There were 70 runners registered for the event in 6 categories this year. The most heavily contested categories were open men and open women, with a good mix of runners on the podium. A detailed list of the results can be found here. The forecast for the race was not promising but the skies did not release a torrential downpour until shortly after the awards wrapped up, which was sincerely appreciated by all volunteers and runners. "We were tremendously proud to host the Canadian Mountain Running Championships this year, and the course highlighted much of what makes this mountain great - singletrack goodness, technical, rocky sections and big vertical terrain." - Tyson Newell, MC and Kicking Horse Resort Marketing Coordinator. Read the rest of Emily and Matthew Setlack's account of the CMRC's here. Newer PostOur hobby horse challenge is back!!! Older Post5 reasons to cross the border for the Golden Ultra this year!